Georgia is a state in the southern region of the United States of America and was one of the original Thirteen Colonies that revolted against British rule in the American Revolution. It was the last of the Thirteen Colonies to be established as a colony. It was the fourth state to ratify the United States Constitution, on January 2, 1788. It seceded from the Union on January 21, 1861 and was one of the original seven Confederate states. It was the last state readmitted to the Union on July 15, 1870. 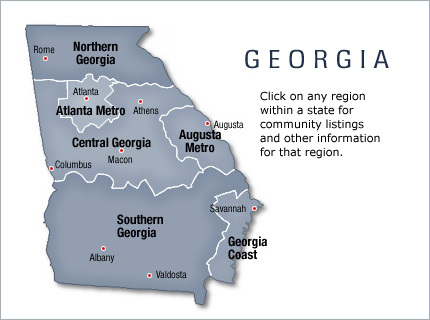 Georgia is one of the fastest-growing states in the United States, with its population increasing from 8,186,453 in 2000 to an estimated 9,072,576 people in 2005. Georgia is also known as the Peach State and the Empire State of the South. The largest city, and capital, is Atlanta.